New York Fashion Week can quickly become an overwhelming whirlwind of runways, fashion peacocks and never-ending cocktail parties. Cut through the noise with this curated guide to the week, hand-selected by Surface staff. Last year was a strong one for 32-year-old Alexander Wang, having left his post as creative director of Balenciaga to focus on his many other projects, like a wildly successful collaboration with H&M. "My friends call me the Energizer Bunny,” he said in an interview with W last year. All this is to say nothing of his own line, which in the fall already seemed to benefit from the extra attention. It was stripe-heavy and remarkably laid back, but with a New York brand of viciousness to it. Spiked sandals, for example, seemed to embrace the way we work hard and play hard. Mistake it for casualwear at your own risk. Joseph Altuzarra credits his international education and diverse heritage—he was born in Paris to a Chinese-American mother and a French Basque father—as major influences on his ready-to-wear designs, and it's hard to argue with him. There's a breezy simplicity to his designs, letting the material do the work in a way that feels common to the French, Spanish, and Chinese sensibilities. It's a bit of a throwback in that way, but one that works. Already a heavyweight and one-to-watch in fashion, Altuzarra, 32, has slowly been gaining notoriety among the non-fashion crowd. He had a successful collaboration with Target in 2014, and the knee-high gladiator sandals from one of his spring collections once served as the inspiration for the cover illustration for an issue of The New Yorker. Monday night at 8 o’clock is an important time slot for Fashion Week, kicking off things with a boom, and in 2014 Rag & Bone took it over from Marc Jacobs. This is perhaps fitting, not only for fashion but for New York: As the city becomes ever more tony, international, and London-like every day, it makes sense that our major fashion show should be a house with British origins that does casual American clothing better than most Americans. Last year Rag & Bone rode the wave of ’90s nostalgia to new heights, and in the fall even partnered with Uber to give away free tickets to its show at St. Ann's Warehouse in Brooklyn’s Dumbo neighborhood. You want the cutting edge? Rag & Bone has set up shop right on it. While much of fashion in the past few years has trended towards the muted—neutral tones, the slimmer silhouette—Marc Jacobs has been steadily turning up the volume with crazy prints and flashy metal accents, much of it like something out of some fantasy storybook. The only real consistency in his work is that it straddles the line between art and fashion. The same goes for his week-ending shows: Last fall, he rented out a theater and staged a mock movie premiere. The man always bobs where others weave. He's already announced that Lana Wachowski—the co-director of the Matrix trilogy—will star in his new ads and that Bette Midler will be the face of his campaign. As a company, Marc Jacobs has been growing steadily since Jacobs left Louis Vuitton in 2013 after 16 years. Almost everything the brand does is exciting. Nightlife don Paul Sevigny's latest venture is still one of the finest nights out in New York. It's tucked just around the corner from the main entrance of the Tribeca Grand (now the Roxy)—hedges hide the door. The interior resembles a kitschy, garish tropical wonderland, offset by a lovely strict black and white tile floor, acting as a grid amidst chaos. Paintings by Josh Smith hang on the wall, becoming ever less valuable each night. The venue used to have a coatroom, but it's now a place for uncouth activities. The dance floor is always crowded, the music blending New Wave classics with the hits of today. Be advised that it does tend to get a bit loud, so it may not be the place for a business meeting. It doesn't get much more classic New York than Fanelli's. From its wood paneling to its red and white checked tablecloth, it's an old-school pub that opened in 1847 and constitutes perhaps the only authentic remaining part of SoHo. These days, it serves as a respite from all the gorgeous high-end fashion boutiques that surround it. Aged fliers promoting 1930s boxing matches pugnaciously adorn the walls and the bartenders are equally prone to scowling. (They're great—they just suffer no fools.) It's the only bar in New York that still sells cigarettes behind the counter, the sort of place where it feels strange to drink anything but whiskey on the rocks. The food is nothing to write home about but everything you'd want. (Expect a very serviceable croque madame.) This is the place to while away the hours discussing whatever you've seen that day. Not everyone was sold on the concept behind Vanity Fair editor Graydon Carter's Waverly Inn back when it opened in 2007. Was it possible for café society to thrive at this late stage of capitalism? Just because something has a velvet rope doesn't mean that people will flock or that what's within is worthwhile. Turns out that sometimes they will, and sometimes it is! The menu is low-key, but just received an infusion of new life from Jeffrey Teller, who joined the restaurant this summer from the M. Wells Steakhouse in Queens. But the real reason to show up is for the dark wood and private club vibe, the centerpiece of which is an impressive mural by Edward Sorel featuring all of “our people”: Andy Warhol, James Baldwin, Norman Mailer, Fran Lebowitz, etc. Just being at the Waverly makes you feel like you belong up there yourself. This is the club for people who don't like clubs. In 2014, Up and Down was updated by owners the Butter Group (which also owns the notorious 1Oak nightclub) to make it more like, as one co-owner has described it, "a theme park adventure," with entertainment and variety at every corner. Gilded wall reliefs clash with clunky neon jukeboxes, and the club rewards exploration. It's the sort of place where it's almost strange if you don’t dance on the tables. The layout also favors discretion, which is probably why it's been a celebrity hot spot in the past year. Fetty Wap held his album release party there, and Leonardo DiCaprio and Rihanna were spotted leaving it together. By the time it closed in 2009, Amy Sacco's Bungalow 8 had made her a legend, with W magazine dubbing her “the jet set’s favorite den mother." In 2012, she finally returned with No. 8, a 16th Street hideaway that feels more like a speakeasy than a nightclub, nestled as it is between two boutique hotels, the Maritime and the Dream. You might even miss the entrance if not for the 8-shaped handle on the door. You don't have to be famous to get in here, but it helps. The décor is a mix of influences. The banquettes scream 1920s, but there's also a disco ball suspended from crystals. Records crowd shelves in the secret upstairs "rec room," which resembles a basement den. It's more than likely that you'll end up here anyway, some label having rented out the space for Fashion Week, but if you haven't, it's worth a trip to the Meatpacking District. As one of Ira Druckier's BD hotels, the Greenwich is part of a family that counts as New York royalty, hotel-wise: The company also owns and operates the Mercer Hotel, the Maritime Hotel, and the Jane. Hidden away in tony Tribeca, the Greenwich features a subtler take on this luxury, as Drukier and co-owner Robert De Niro seem to want to impress at every turn. Take, for example, the pool hidden within its Shibui spa, which features a 250-year-old antique bamboo roof imported from a Japanese farmhouse. The legendary art dealer and designer Axel Vervoordt modeled the hotel's penthouse in a similar Japanese philosophy of wabi-sabi. To top it all off, the hotel is also home to one of the city's finest Italian restaurants, Locanda Verde. Barry Sternlicht, the CEO of Starwood Capital Group and founder of the W hotel chain, has a mantra for his new 1 Hotel group: “Not a brand, it’s a cause.” The boutique, eco-friendly 1 Hotels debuted last year in Brooklyn and South Beach, but it's the Central Park location that's perfectly located for Fashion Week goers. Lovingly situated adjacent to the Plaza, the 1 offers a fresher and more conscious experience with no sacrifice to luxury. Think LEED certification, complimentary in-room yoga mats, triple-filtered water, and reclaimed wood as far as the eye can see. The hotel also features an impressive vine-heavy facade, and a restaurant that’s nearly as green. Chef Jonathan Waxman has resurrected his groundbreaking, locally sourced restaurant Jams, an Upper East Side staple in the 1980s, for the Central Park 1. Start your day with his signature salmon-and-crème-fraîche-topped pancakes. The Lower East Side has been gentrified for years, but in many ways the 17-story Bowery Hotel is ground zero for the vibes that have swept the neighborhood in recent years. The lobby is always a buzzing meeting space for people of all stripes—hipsters, Wall Streeters, and everyone in between. The lobby itself is a sight to behold: an Old World aesthetic, with wood paneling, Moroccan tiles, and oriental rugs. The bathrooms are reminiscent of an old-school apothecary. The building was designed by Albert Ledner in 1966 and still largely resembles its original factory-like exterior. Keeping the skeleton was important to co-owner Eric Goode, even if, as he told Vanity Fair when it opened, “The building was literally built out of Styrofoam.” The Taavo Somer–designed restaurant Gemma is envisioned as an "Italian brasserie" that feels like charmingly crowded trattoria, and is always good for celebrity spotting. The glamour, the style, the power—was there anything more New York than Studio 54? 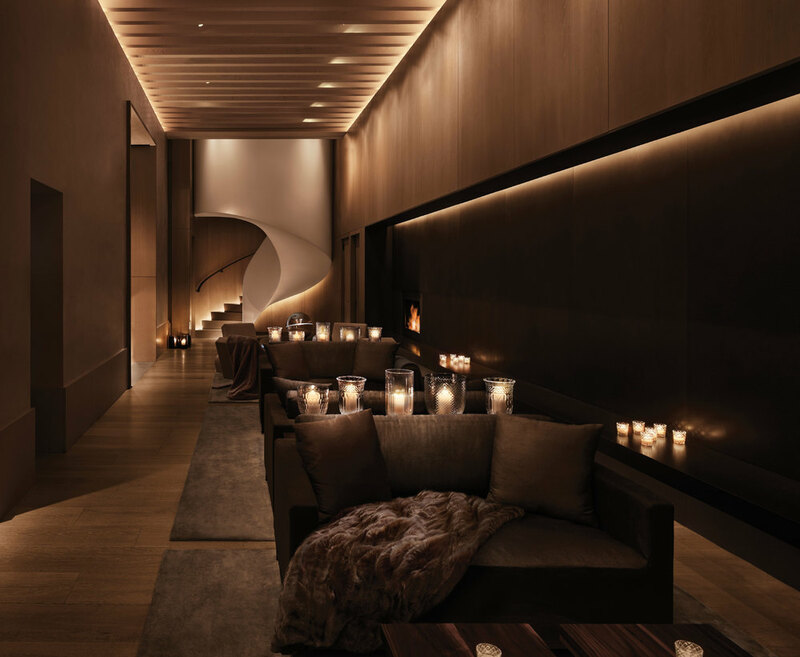 Its co-founder Ian Schrager went on to pioneer the concept of the boutique hotel, and he's outdone himself in his latest effort in partnership with Marriott International, the Edition series of hotels. Inspired by private clubs of the 20th century, the new New York hotel is carved out of turn-of-century clock tower bordering Madison Square Park. (Some rooms on the 27th floor apparently feature secret doors that open up to the mechanics behind the clock face.) In true Schrager tradition, the vibe is laidback and most of the interior colors are neutral, aside from the garishly framed photos that cluster the wall of its main restaurant, which marks the U.S. debut for chef Jason Atherton, London's Michelin star–winning up-and-comer. Minimal and welcoming don't always go hand in hand, but that's what the Rockwell Group and Schrager aimed for—and achieved—in the architecture. Crazy as it sounds, Steven Kolb, the president and CEO of the influential Council of Fashion Designers of America, is actually a bit of a fashion outsider. His background is more in philanthropic fundraising, and he's said CFDA board chair Diane von Fürstenberg hired him in 2006 partially because he's a Libra. Yet the position has made him one of the top people in fashion, and needless to say he'll be at everything this Fashion Week (he’s likened the CFDA to "air traffic control" for the week). Moreover, his unique background means he has a sensibility all his own. His photos cluster around certain shapes and silhouettes that other photographers might skip over. Perhaps that’s part of the appeal of his account: You can tell he's having a good time. With all due respect to Patrick McMullan, his former protégé Billy Farrell has the upper hand when it comes to Instagram. Want to see Lorde and Tilda Swinton yukking it up? Sure you do. Want to see Aaron Paul touching the art at a Chelsea gallery opening? Of course. A close-up of Michael Chow lighting a life-sized candle of himself by Urs Fischer? You're all over it! BFA knows which celebrities you actually care about, and which Instagram-celebrities are Instagram-famous enough to merit your attention. “You're only as good as your last party,” Farrell once told Paper magazine. Rest assured that Farrell's photographers will be at all of Fashion Week's hottest parties, capturing them with the aplomb and enthusiasm that you as a gawker deserve. If they don't cover it, it probably isn't worth your FOMO. Vanity Fair dubbed her the “Supermodel with Serious Social Media Chops," which is accurate but reductive. This witty 20-year-old Malibu native also happens to be a best friend to Taylor Swift and Kendall Jenner (who is also technically an ex-step-sibling-in-law), and dates former One Direction member Zayn Malik. (And all this is to say nothing of her eyebrows, which are incredible.) An “It Girl” for our time, her social media interactions with the fashion world are personal and charming (think: green room shots, Polaroids, robes; hugs in stairwells; Star Wars jokes with Karl Lagerfeld). There's a vulnerability to her that other supermodels lack. ""I don't change anything about myself," she recently told British Vogue, "what I post just works. When people are different on social media than they are in real life, it becomes forced." If you only follow one model this Fashion Week, make it Gigi. There are plenty of fashion photographers on Instagram, so why should you follow Joshua Woods? Well, this 29-year-old upstart actually began his career at Fashion Week, back in 2012, picking up a camera to shoot it just for fun. Since then he's made his name with gorgeous washed-out portraits and intimate behind-the-scenes shots from the hottest shows, all with such production quality that you wouldn't guess that most are shot on an iPhone. Hood By Air and Public School have invited him backstage and T: The New York Times Style Magazine runs his photo diaries. No matter the subject of the photo, he brings a seductive sensibility that's all his own. Woods especially excels at men's fashion, which by many counts is the most cutting-edge part of the industry today. Keep Woods in your feed for substance with style. Presented in partnership with Surface Hotels: Stay at the world’s best designed hotels—curated by the editors of Surface magazine.